Wedgewood, Western-Holly, and more. Click to Order Manuals below. Click to order #7 - Analyze and Repair 'International Register' Clocks & Timers. Clock Timers, or Timer and Solenoid Valve remedies. Hi, my name is Jack Santoro. 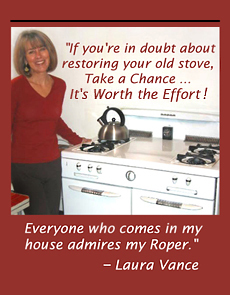 I am the American Antique Appliance Historian and Editor of "The Old Road Home", a vintage appliance magazine. My specialty is restoring antique stoves. Since 1969, my company, J.E.S. Enterprises, Inc. has restored or refurbished over 17,000 stoves. If you've read this far, I'd have to guess that you also have an interest in beautiful old ranges. "Would you like to purchase or restore an Antique Gas Stove like a real pro ?" After 50 years in the antique stove business, we have experienced and found a solution to most every problem you can think of pertaining to an old stove. The best techniques are compiled into the seven books which appear above. Some of my students enjoyed rebuilding their ranges so much they have since opened their own restoration businesses and are now doing great work for other folks! cherish for a lifetime, these are the tools you need. truly a knock-out. You'll read about at it at the end of this article. Do you stop dead in your tracks when you a see gorgeous old stove? If so, here are the shop manual reports you need to successfully purchase, repair and correctly maintain a dynamic range. They will help to bring your dream stove right into your own kitchen. These almost bullet-proof stoves, made so more years ago, will never be manufactured again. Each manual is described for you below. #1 - HOW TO REVIVE THE PORCELAIN FINISH ON YOUR ANTIQUE STOVE The original finish on your stove is almost always the best coating it will ever have. Over the past 50 years, we have developed a dynamic technique to deep clean, brighten and gently resurface all of the enamel on your range. As a bonus, you will also learn how to eliminate ugly rust and carbon marks and mask scratches, too. For the best possible original appearance, and to save you more money and time than you can imagine, a "must have" is Manual #1 . (Note: The procedure outlined in this report can be done at home with products available at your regular grocery or hardware store. Wait until you see the improvement. The luster is breathtaking! Hello, I recently purchased an old Glenwood stove and plan to follow the directions in your book for restoring it. I bought "How to Revive the Porcelain Finish on Your Antique Stove" earlier this year. It's great! I'd be lost without it. #2 - HOW TO REPAIR CHIPPED PORCELAIN - What could be more detracting to a stoves' appearance than chips or divots in the porcelain finish? If you would like to repair these "accidents", you can! It's easy to learn how to mix, match and apply colors and patching material for a blemish-free finish. It does take time and patience to master the technique, but once you have it "under your thumb" you will be able to repair these divots for as long as you own your range. Latest sources of patching materials included so you can keep your classic stove truly gorgeous forever. *Note: Not for oven interiors. For exterior repairs in non-direct high heat areas only. #3 - HOW TO LOCATE AND PURCHASE THE RIGHT VINTAGE STOVE - This is the most important tool anyone could ever own if they wish to purchase a antique range. You cannot make a mistake purchasing a poor range once you absorb this information if the range does not meet the criteria we set. Fuel considerations, size and weight factors, finishes, insulations, testing on site, plus much more, are all covered. Also included, over 40 places in almost any county of the USA where you can search for great vintage stoves. Knowing how to "buy right" will ensure that you are getting the best stove for the least amount of money. I still cannot believe I purchased an original Chambers 61-C range for just $50.00! I always wanted an antique stove, but was afraid to buy one over the internet since I could not view it in person. Using just one of the techniques to find a good local range in the #3 How To Locate and Purchase the Right Antique Stove, I am now the proud owner of this superb range. You are a class act all the way! #4 - HOW TO RESTORE THE 'BAKELITE' PIECES ON YOUR RANGE We've designed an exclusive method to restore the original dials, handles, plastic, and salt and pepper shakers on your range to look sensational. Every technique we have created is fully revealed - plus, you will learn the easy way to re-detail all of the numerals and lettering on the each piece you are restoring. The results are absolutely breathtaking! #5 - HOW TO REPAIR OVEN AND BROILER DOORS - Restore the doors on your mid century classic range right back to the original factory-tight fit using manual #5. Door ailments will affect cooking, the porcelain finish, and other stove functions like a plague. Learn how to eliminate these problems forever. Your stove will not only cook, but look 100% better! Click to order yours below. FREE with all Shop Manual orders I guarantee one full year of free consultation! Pick your Antique Gas Stove How to Manuals below. Press your 'back arrow' button to continue shopping. Digital How to PDF files are Searchable! Open to Print. Note that manuals with illustrations take Time to Print. Easy to Get Started... 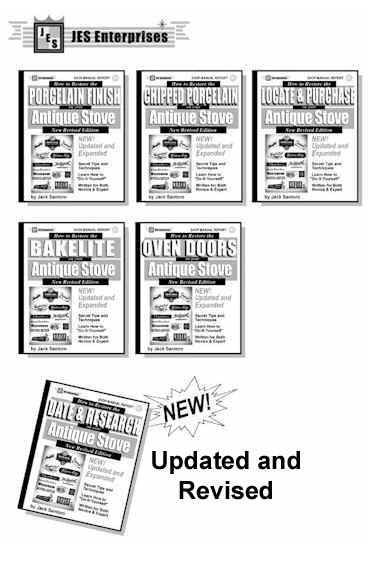 Pick your Antique Gas Stove instant digital How to Manuals below. 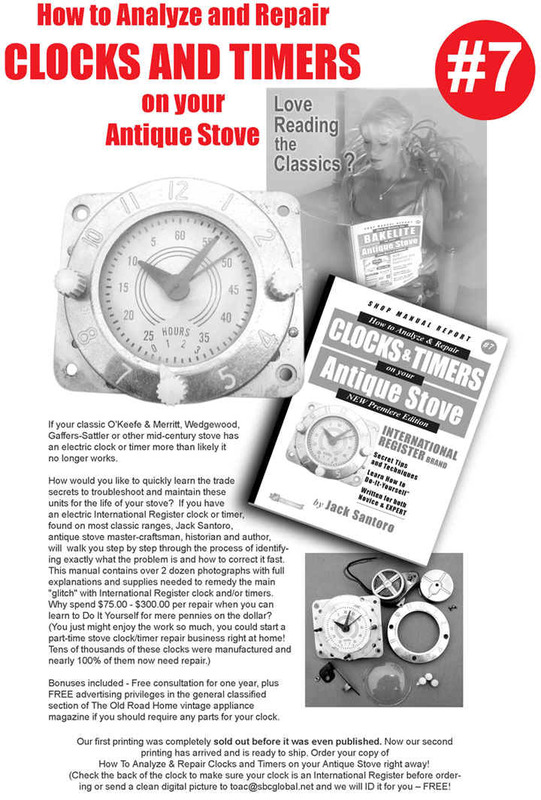 #7 - How to REPAIR YOUR CLOCK and TIMER - International Register for mid-century antique gas stoves. To identify yours email a picture of your clock face to toac@sbcglobal.net or look on your clock housing for the International Register stamp . Don't see what you are looking for?...just email a picture and questions. Please note that "all sales are final" on published and educational materials. Thank you. All pdf orders are delivered within 24 hours to your email address. All sales final on printed or electronic manuals or publications.